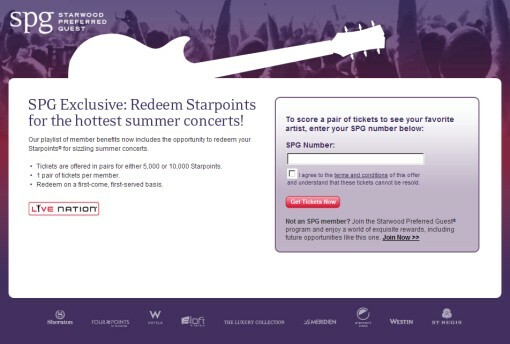 Starting today (June 29), you can redeem your Starwood Preferred Guest Points for Live Nation concert tickets; hold on Jonas Brothers, here I come! Your chance to redeem Starpoints for Live Nation concert tickets. Reserve your tickets beginning on June 29, 2009, at noon EST. Amp up your summer with a Starpoints redemption offer that really rocks: premium seats to see your favorite bands. Choose from an amazing list of today’s hottest musical artists and most exciting concert venues. * Tickets are offered in pairs for either 5,000 or 10,000 Starpoints. * Redeem on a first-come, first-served basis. * 1 pair of tickets per member. * Select your tickets beginning on June 29, 2009. Tickets will go quickly, so remember to bookmark this site and check back on June 29, 2009, at noon EST to make sure you score tickets to your favorite summer show!